John Carradine and Boris Karloff are on the panel this time—and the host foolishly attempts to stump Carradine with Shakespeare quotes. Gee whiz, the man was a noted Shakespearian actor when he wasn’t making horror movies. It’s pretty apparent that he knows all the plays by heart. The ending is missing from this episode, but like all good Information Please shows, it’s so much fun listening to smart people being witty without being condescending that it’s worth listening to anyways. "He Steals and Murders Openly"
We've been taking an occasional look at Robert E. Howard stories in which he uses a very effective trick to generate suspense: The protagonist is forced to team-up with a sworn enemy. The two must work together against a common enemy or because they have a common purpose, knowing that they'll try to kill one another as soon as that purpose is achieved. 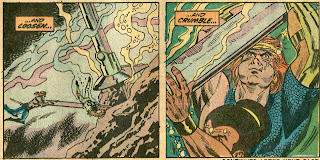 Conan the Barbarian was forced into this situation in "People of the Black Circle." But that's wasn't the first time he'd been in a reluctant alliance. Not long after Conan came to civilization--still naive about the ways of civilization (and probably still a teenager)--he became embroiled in the machinations of two feuding noblemen. All this is recounted in "Rogues in the House," first published in the January 1934 issue of Weird Tales. It's set in an unnamed city-state or minor kingdom. The puppet king is controlled by Nabonidus, known as the Red Priest and also known to bring his political enemies to an unpleasant end. He's looking to do this to Murilo, a nobleman who has been lining his pockets by selling state secrets. Threatened with exposure, Murilo hires Conan to kill Nabonidus. But the twists and turns of the plot soon land all three men in a catacomb beneath Nabonidus' mansion. Above them is Thak--an ape man that Nabonidus kept as a servant. Thak, it turned out, was just human enough to harbor ambitions of his own. He's killed Nabonidus' human servant and taken over the mansion. So leaving the catacomb by the only available exit--through the mansion--means walking into the sharp talons and fangs of a brutal, super-strong humanoid creature. The only way the three men can get out alive is to work together. The story is one of the best of the original Conan tales. For one thing, it's a textbook example of good plot construction. In just a few paragraphs, REH introduces us to the main characters and tells us enough about their relationships and their personalities to give us a firm lock on them. He then moves the plot along quickly but logically, mixing in suspense and action in just the right doses. Howard also mixes in the thematic aspects of the story so that it complements the plot without ever slowing down the action. Murilo and Nabonidus are rogues--dishonest men who use their power and position for personal gain. Even though Murilo is actually a little likable in that he shows personal courage when he has to, both men are essentially rotten hypocrites and thieves. This is contrasted with Conan, who may also be a thief but at least isn't a hypocrite. As Murilo phrases it: "This Cimmerian is the most honest man of the three of us, because he steals and murders openly." What good that may do the person Conan is robbing and murdering is debatable, but Howard still has us rooting for the big guy. It's really quite a balancing act in terms of good characterization. 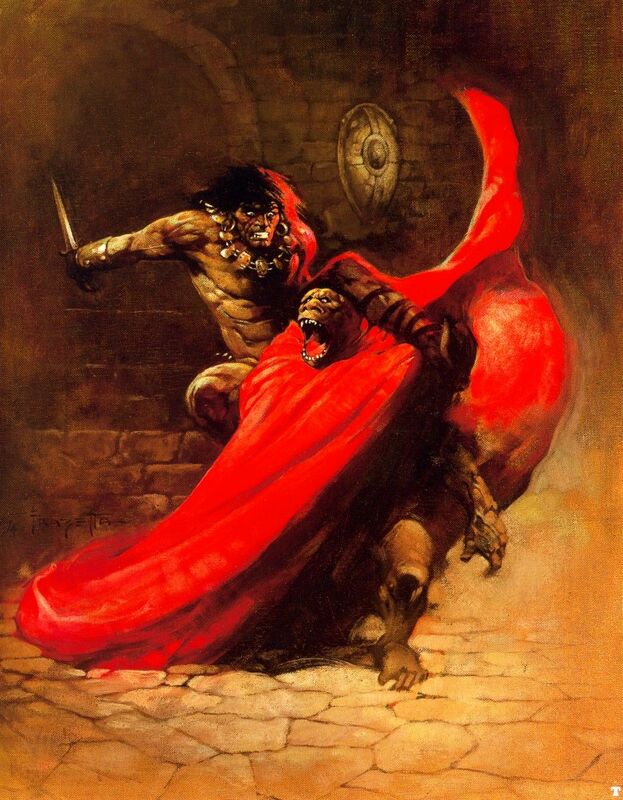 Conan does murder during the story, but he still has standards that raise him above Murilo and Nabonidus. For instance, he shows a degree of mercy to a woman who had betrayed him. Well, sort of. He drops her in a cess pool instead of killing her. And he gutted her new boyfriend a few moments before that without batting an eye. But he refrains from killing a woman nonetheless. He also shows loyalty to an agreement he made with Murilo even when he could have gotten safely away from the city. So we end liking Conan and hoping he survives despite his moral flaws. Aside from the theme and the characterizations, the key action set-piece in the story is fantastic. 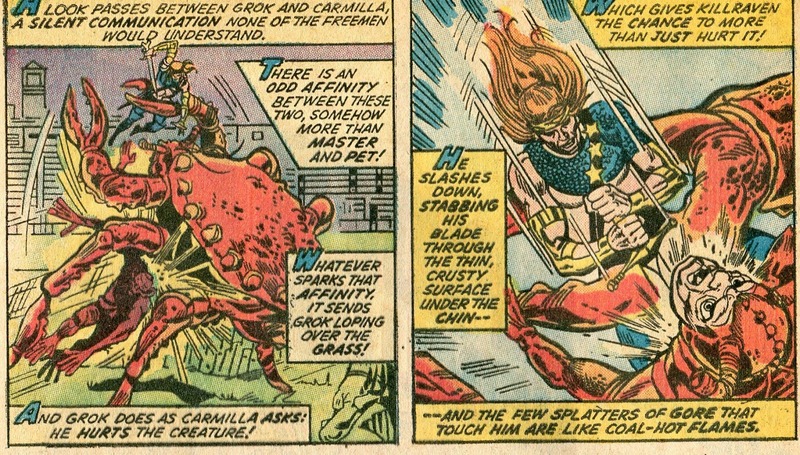 Conan and Thak inevitably go up against each other in a savage hand-to-hand battle and it is truly awesome. Howard had a knack for describing exciting fight scenes, but this one still stands out from the crowd. 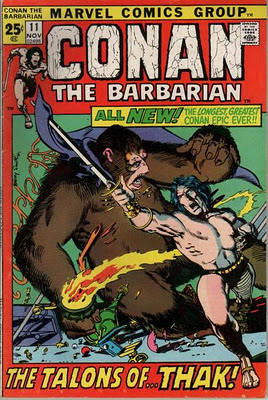 When you consider all of Howard's Conan stories together and remember that he did not write them in internal chronological order, then the character arc he gives the barbarian is a really remarkable achievement. The first Conan story Howard wrote shows us the barbarian as a king, with a degree of wisdom and maturity (though without losing the ability to hack his enemies apart in droves). But stories about a young Conan give us an impetuous thief and killer who barely understands much of what civilization has to offer. Stories set between these time periods give us a Conan who is maturing into a leader, less likely to act on blind impulse. "Black Colossus" (published in 1933) is a good example of Conan's overall character development. Set at a time when Conan has largely left thievery behind to work as a mercenary, the story shows us the first time he is given command of an army. Outnumbered, he deploys his troops in a conservative defensive manner. When someone comments that Conan normally leaps into the thick of a fight, he explains that he usually only has himself to look out for. But now he's responsible for thousands of lives and must act differently. It's a key moment in his career, allowing us to believe that this is a man who can one day rule a nation. Once again, Howard didn't write these stories in any order. Each successive story jumped from one point in Conan's life to another at random. But string them together in an order that makes internal chronological sense and you have a definable and fascinating bit of character development. All this and great fight scenes as well. Because that fight between Conan and Thak really does drip with awesome sauce. We have one more example in which an REH character has to team up with an enemy. This will involve the pirate Black Vulmea, whom we visited once before. Before long, we'll take a look at "Black Vulmea's Vengeance." Then it will still turn out there are things you don't know. 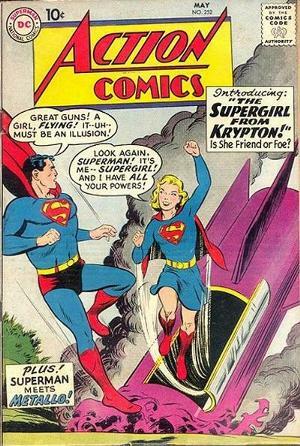 For instance, I knew that the first Metallo (John Corben) originally appeared in Action Comics #252 (May 1959)--the same issue that introduced us to Supergirl. I knew Corben died in this story and some time later his brother Roger became the second Metallo. But I was somehow under the impression that Metallo #1 was resurrected and made at last a few more appearances during the Weisinger-era of Superman stories. But, by golly, I was wrong. John Corben had one and only one appearance. That story was written by Robert Bernstein and is a pretty good one. A reporter named John Corben has committed murder to avoid getting caught embezzling money. But while making his getaway from what he thinks is a perfect crime, he's in a car wreck. A scientist named Professor Vale finds him and--as the only way of saving the badly injured Corben's life--rebuilds his body out of metal. I should pause here to say I like the way the story handles Professor Vale. He isn't doing this because he's a mad scientist driven to insane experiments. He does it because Corben will die if he doesn't and he later breaks the news to Corben as gently as he can. Vale is obviously just a decent human being taking the only options open to him. Then Vale has a stroke and collapses, taking him out of most of the rest of the story. He gets better near the end of the tale. I'm glad, even though I'm pretty sure he doesn't ever make another Silver Age appearance. He's a nice guy. The robot body still appears human and retains Corben's outer appearance. When he discovers he has super strength, Corben decides he's happy with the situation. He moves to Metropolis and (because the murder he committed is still unsolved) gets a job on the Daily Planet. 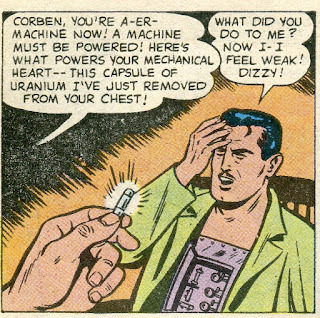 But he must soon go on a crime spree, raiding labs and hospitals to steal the uranium he needs to power his mechanical heart. When he learns that Kryptonite will also work, he tries to steal some from a Superman souvenir show and nearly killed Supes with a small bit of Kryptonite he stole from Professor Vale. But Corben doesn't realize that the Green K being kept at the show is fake. 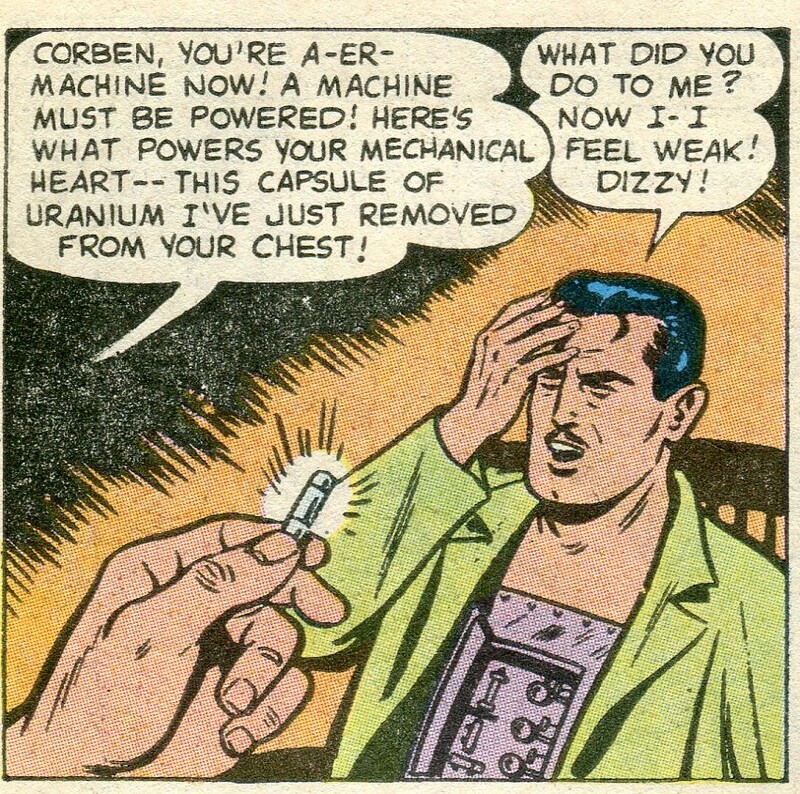 When he tries to use it, his heart powers down and he dies from heart failure. The story has its flaws. 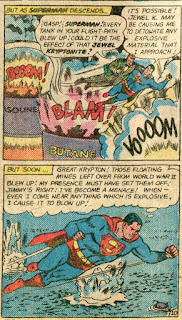 The Man of Steel performs a couple of super-rescues during the course of the story, but these are just random events unrelated to the main plot. They too obviously exist just to make the story come out to the correct page length. 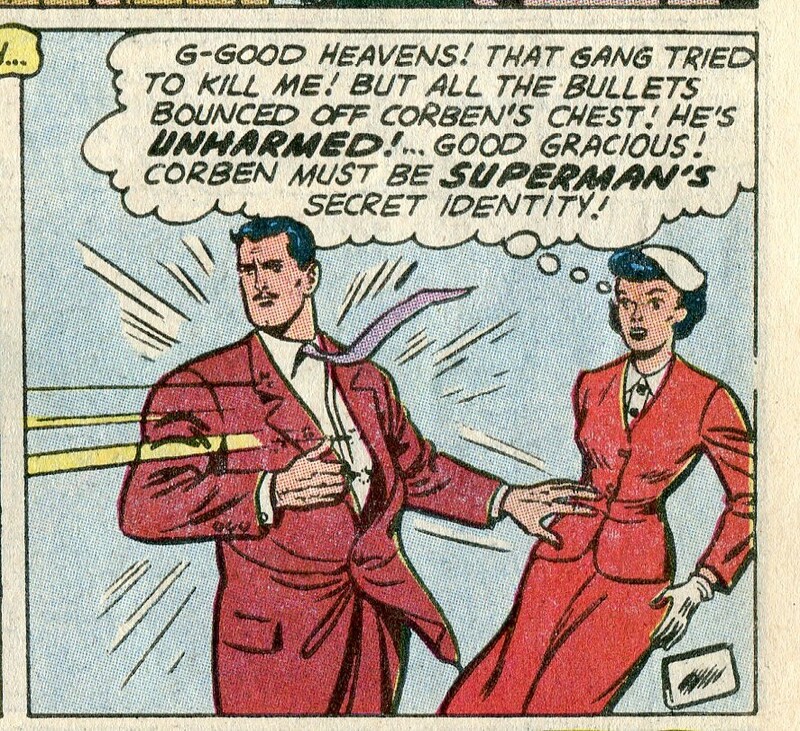 Also, a sub-plot in which Lois thinks Corben must be Superman is abrupt and doesn't really go anywhere. But even so, it's still an entertaining story with an interesting villain. 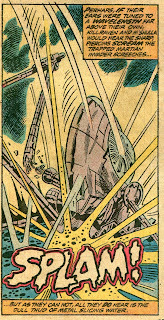 But that was it for Metallo as far as the Weisinger-era books are concerned. And it wasn't until 1977 (after 18 Metallo-less years) that his brother Roger had his brain transplanted into a new Metallo. Roger proved more successful at villainy than his brother. I suspect this was because Roger had a much cooler visual design--he started out human looking, but eventually morphed into a more interesting robot body. Also, being able to shoot Kryptonite radiation out of his chest is a pretty nifty power. So there you go. 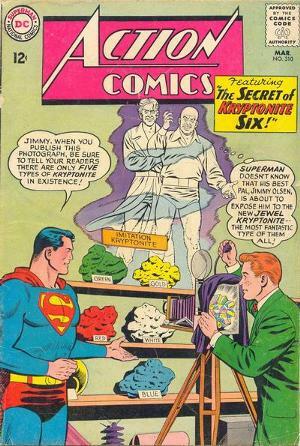 I thought John had at least a few appearances and I thought Roger came into Superman's mythology much earlier. But I was wrong. I always wondered what that felt like. Here's an early image of the Lone Ranger when he was still primarily a character on the radio. It's not a bad design for the character at all. Lucille Ball does a chilling job of playing a coldblooded femme fatale who will do anything—including double-crossing two different husbands—to further her own ends. Of course, that sort of behavior can eventually come back to haunt you. 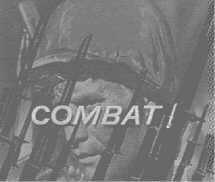 If I had to pick a favorite TV show, it's probably be Combat, the 1962-67 show about infantrymen in World War II France. Intelligently written, beautifully photographed in black-and-white for four of its five seasons and with actors who brought their characters to life, it combined great action with strong plots. 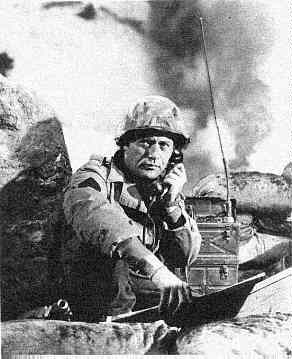 Vic Morrow played Sgt Saunders, the tough squad leader. He was really the backbone of the show--Saunders was a man determined to do his job as a soldier, but he also looked out for his men AND he never lost track of the difference between right and wrong. And that's one of the reasons this show is my favorite. A number of the best episodes placed Saunders and/or some of the other soldiers in a position where it was difficult to figure out exactly what the correct moral decision is. Here are good men fighting one of history's few truly just wars. That meant they had to shoot a lot of enemy soldiers in order to win the war. Most of the time, the show (I think quite correctly) assumes that this is justified. But sometimes, things aren't so morally clear cut. The series premiered on October 2, 1962 with such an episode. Directed by Robert Altman, "Forgotten Front" is a true classic. Saunders and three of his men are sent behind enemy lines to set up an observation post. They need to spot a big German artillery gun and radio in its location. That gun needs to be knocked out before the American troops advance the next day. So far, so good. This is a perfectly legitimate mission to accomplish a perfectly legitimate goal. When setting up their post in a partially wrecked factory, they find a German inside. They take him prisoner. Still good. They're at war with the Germans. Capturing or killing the enemy is their job. But then things get complicated. 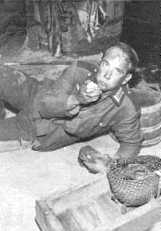 This particular German prisoner is an aging ex-carnival performer who (he claims) had deserted the Werhmacht in hopes of surrendering to the Americans. As he explains: "I know what you think. 'This is the enemy.' Well, I am no one's enemy. I never had a fight in me. Never." They plan to take him back to their own lines after their job is done. But one of the G.I. 's thoughtlessly blabs about the American advance while the prisoner is listening. Then a German tank parks outside the factory. The Americans will have to make a break for it and it no longer seems practical to bring a prisoner with them. So what's the right thing to do? If they leave him, he might tell the Germans about the impending American attack. But if they can neither take him along nor leave him behind, is the only other option shooting the poor guy? Albert Paulson plays the German with the perfect balance of pathos and charm. He's just a nice guy stuck in an army he did not willingly join. He's no a villain. As writer and Combat scholar Jo Davidsmeyer points out: "The story has no villain, except for the war itself." And Morrow is wonderful as Saunders. Sgt. Saunders was one of TV's toughest tough guys, right up there with Matt Dillon or Robert Stack's version of Elliot Ness. But Morrow played him in a way that never let us forget he was just a human being. To quote Jo Davidsmeyer again in her excellent review of this episode: "Besides playing the many levels of a harried and exhausted soldier leading men who don't wish to be lead, [Morrow] shows us a man at odds with his own actions and with what he must ask of his command." Pierre Jalbert, playing one of the GIs, also shines in this episode. "Forgotten Front" is an awesome piece of drama, believably setting up a situation in which good men struggle over a real moral dilemma. As recorded in H.G. Wells excellent history book The War of the Worlds, the world was invaded by Martians around the turn of the 20th Century. The Martians, with their tripodal fighting machines, heat rays and poison gas, were pretty much curb-stomping the human race. But they succumbed to Earth bacteria and humanity was saved. But they came back. In 2001, the Martians (now properly immunized) came back and crushed the human race. Humans are enslaved, with some people willingly serving their Martian overlords. Slaves are forced to fight as gladiators, while human scientists working for the aliens conduct hideous biological experiments. As horrific futures go, this is a potentially effective one. It makes use of Wells' Martians--with their visual awesome fighting machines--and creates a situation that's fodder for a lot of good drama and action. 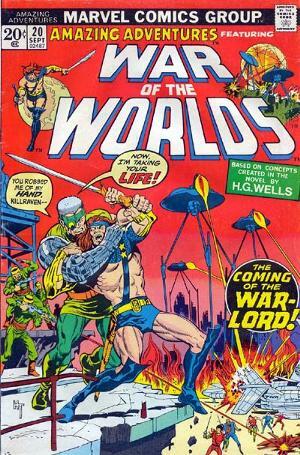 Marvel Comics brought the Martians back to Earth in Amazing Adventures #18 (May 1973). The main character is Killraven, a top gladiator in the Martian arena who escapes and becomes the leader of a small band of freedom fighters. He spent a total of 22 issues fighting aliens and traitorous humans. He popped up in an issue of Marvel Team-Up to fight beside a time-hopping Spider Man, and he had a few other appearances over the years, but he seems to have drifted away into obscurity. But he didn't do half-bad while he was around. 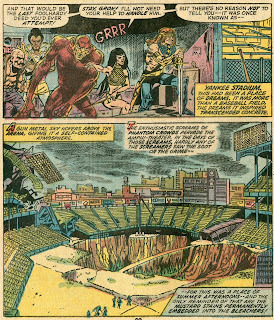 Take Amazing Adventures #20 (September 1973), for instance. Killraven and his right-hand man M'Shulla are embroiled in a fight amid the ruins of New York City against some of the many humans who now work for the Martians. When their energy pistols run dry, they take refuge in a museum that houses various weapons from throughout history. This allows them to use spears, crossbows, throwing stars and (at one point) a toppling statue to take out the humans. It's a fun fight. 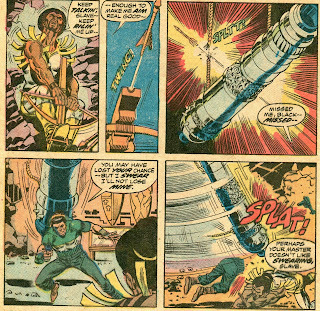 Herb Trimpe is the artist and he (like so many artists from the 60s & 70s) knew how to choreograph a fight scene. The visuals are crisp and, despite the potentially confusing series of tactics used by Killraven and M'Shulla, we always know what's going on. and they're ambushed and captured by the Warlord, a thug who lost his original right arm in a fight with Killraven some years earlier. It's very much an action-oriented tale, but writer Marv Wolfman uses that action along with dialogue to establish the characters. Some of the dialogue is overwrought, but it does effectively carry the story along and lets us know that Killraven is driven by anger and determination. Here's a guy who will not give up until the Martians are all dead. 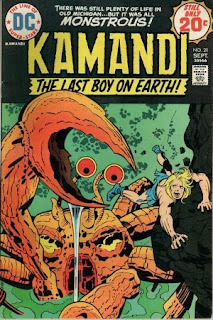 I read this one as a boy (so--as with the Kamandi comics I talked about last week--my view of it is possibly colored by nostalgia), but back in those ancient times, we got our comic books off the rack at the 7-11. No specialty stores or pull lists to make sure you got every issue. So I missed the next issue and it wasn't until Ebay came into being decades later that I was finally able to acquire and read the conclusion. Amazing Stories #21 begins with Killraven still struggling against his captors even as the Warlord has him strapped down to a table for a pleasant afternoon of torture. But a female biological scientist named Carmilla Frost (who had been making monsters for the Martians) and her sort-of ape creature Grok stage a rescue. 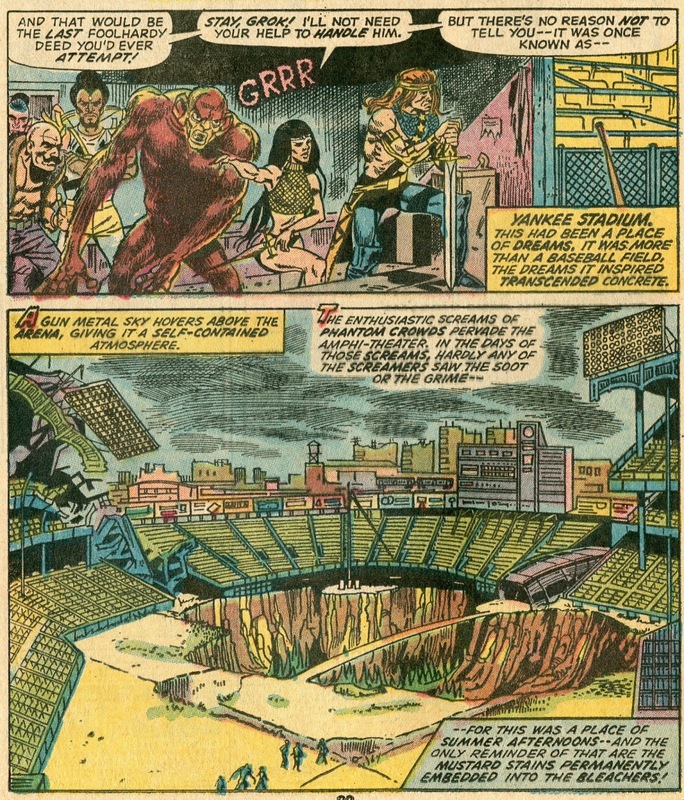 She's doing this for (as yet unrevealed) reasons of her own, but the end result is Killraven, his men, Frost and Grok coming out of the Martian base into the ruins of Yankee Stadium. 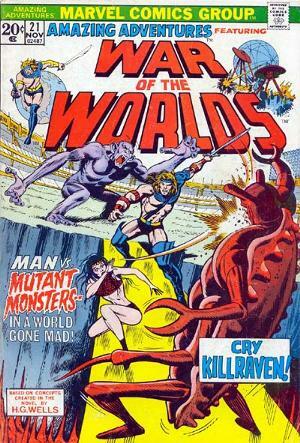 Here they fight some biologically-created monsters and the Warlord gets his comeuppance before the good guys escape. 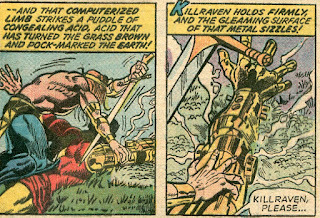 But the future world of Killraven didn't have quite the longevity that Kamandi had, nor are there as many fond memories of him as there are for Kamandi. Beyond the fact that Kamandi was drawn by Jack Kirby, I think I may know the reason for that. 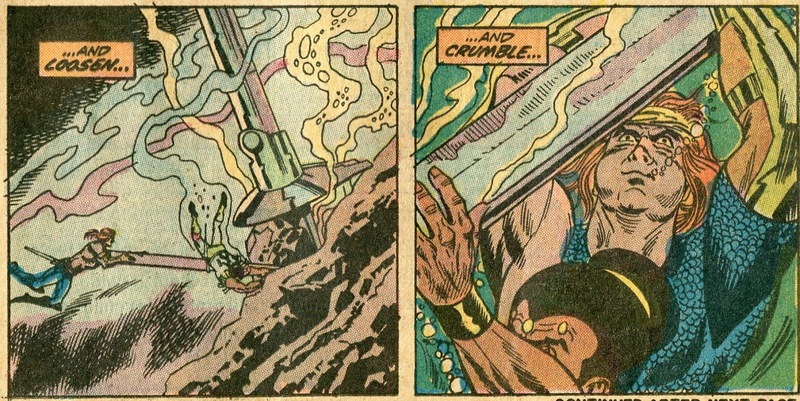 Kamandi pretty much just wandered his world, getting into a variety of individual adventures. And this was fine--it's something that worked for that particular character. Killraven was leader of a band of freedom fighters, but the small victories they had throughout the Amazing Adventures run consisted of largely self-contained individual adventures and never really seemed to bring them any closer to overthrowing the Martians. This, I think, was a mistake. 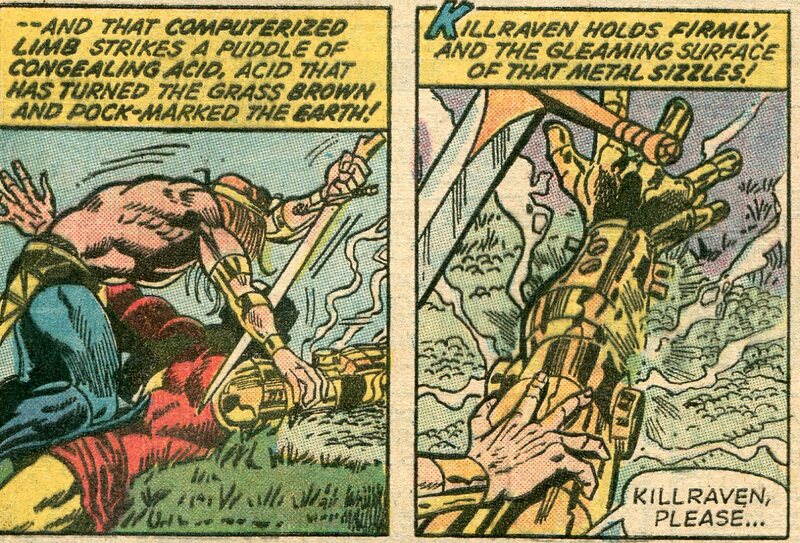 The premise of Killraven pretty much demands an extended story arc. We needed to see Killraven's army slowly grow as he made real advances (and suffered real setbacks). We needed to see him grow as a character, learning to better control his anger to find the balance he needs to be an effective leader. The series needed to gradually and believably progress from stories of a small band of resistance members to tales of forming a full-fledged army which (perhaps) takes back small parts of Earth from the Martians. Perhaps Killraven's activities would allow humans in other part of the world to rise up, forcing him to become a politician and diplomat as well as a soldier. There was a lot of potential here, but the series and the character never really lived up to it. It was a fun comic for what it was, but it really needed to be a little bit more. 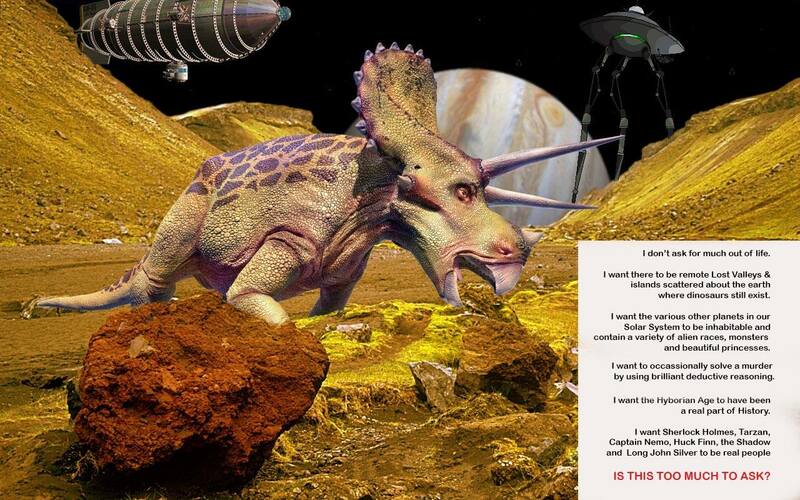 As I've said before--it's never wrong to include dinosaurs. A man orders a “How To” kit to build a robot dog. When a human robot is shipped to him by accident, he decides not to report the mistake. That decision snowballs into legal woes and a conflict with the most frightening organization ever to inhabit a science fiction story—the Internal Revenue Service. 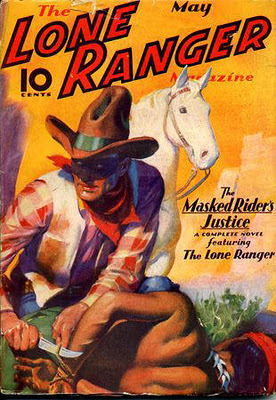 Otis Adelbert Kline was a pulp writer from the 1920s/30s who made a living emulating Edgar Rice Burroughs. For instance, he wrote about Jan of the Jungle, a Tarzan knock-off who had adventures in the jungles of South America and India. 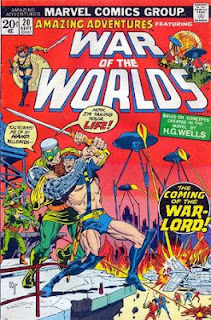 He also tried his hand at the same sort of Sword and Planet story that Burroughs perfected with his John Carter of Mars tales. In fact, there was a report kicking around for quite a long time that Burroughs and Kline were in a literary feud because of this, but that's since been debunked. Kline did overtly copy Burroughs' popular formulas, but he did so with skill and left us with some very, very entertaining tales. He retired from writing in the 1930s and become a literary agent. Robert E. Howard was one of his clients. Kline wrote two novels set on Mars and three on Venus that all take place in the same continuity. The Venus novels were published first (beginning in 1929), but the Mars tales take place first. We'll be covering them in the proper order--so we will start with The Swordsman of Mars (first serialized in Argosy magazine in 1933). But enough of my research failures. Let's get to the good stuff. Dr. Morgan has come up with a nifty way of transporting men to other planets. He's built a device that can swap the minds of two men--so the mind of Person A will inhabit the body of Person B and visa-versa. This machine can work over vast distances and move minds back and forth through time. So he can effectively send Earthmen to Mars millions of years ago, when a human civilization existed there. He telepathically finds a Martian and an Earthman with identical body types and matching thought waves, then (after both men volunteer) swaps their minds. But the first guy he sends to Mars--Frank Boyd--proves to be a villain. Soon Boyd (now in the body of a Martian named Sel Han) is the right-hand man of a brutal dictator and is planning on taking over himself at the first opportunity. Morgan can't bring Boyd back against his will. So Morgan instead sends an adventurer named Harry Thorne to Mars (swapping with a man named Borgen Takkor) to stop Sel Han. And that's where we enter the adventure. I agree with most of the commentators I've read who state that Kline is not quite as good a writer as Burroughs--Kline's Mars falls a a little short of the sheer awesomeness of John Carter's adopted world. Also, Kline isn't quite as good as fitting exposition into the novel without slowing the action down. But Kline's Mars is still a fun place. It's certainly got a cool back-story. Apparently, our moon was once a planet orbiting between Earth and Mars, inhabited by a race of men called the Ma Gongi. These guys fought a war with Mars, with both sides using extremely destructive weaponry. The Moon was rendered uninhabitable and knocked out of its original orbit, with surviving Ma Gongi still living on Mars. Both civilizations lost much of their advanced technology, which provides a good reason for everyone fighting with swords and javelins despite the presence of some more advanced gadgetry. There's any number of bizarre monsters on Mars--as there properly should be in any Sword and Planet tale. This includes several tame beasts, most notably the gawr, a large bird-like creature that's used as a mount. Martian cavalry is therefore airborne. There's also the dalf, a carnivorous amphibian. Thorne makes good use of a trained dalf named Tezzu several times during the story--something that reminded me rather overtly of John Carter and his calot Woola. 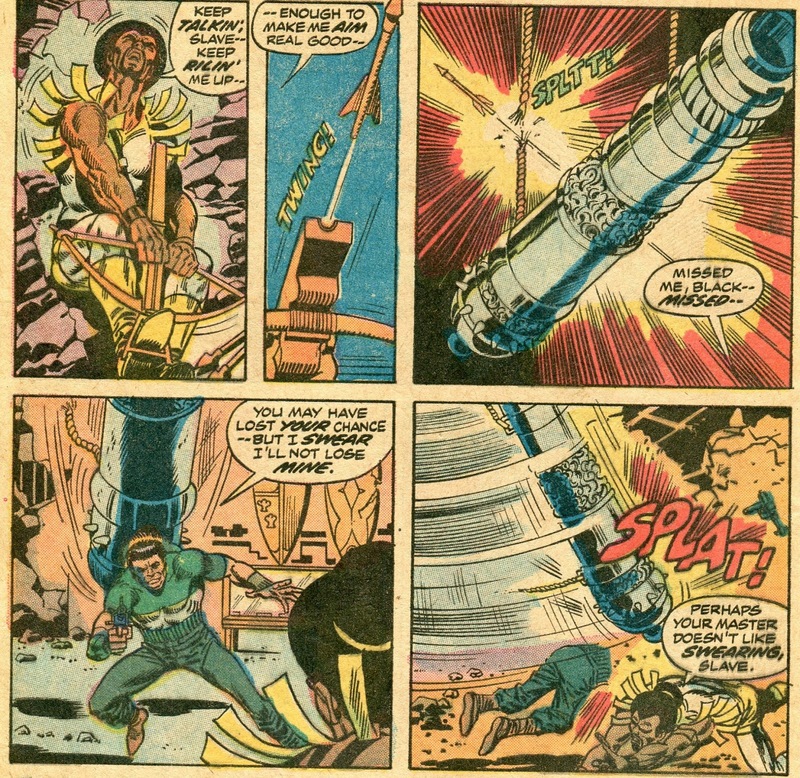 Anyway, the villain Sel Han has allied himself with the Ma Gongi and is trying to recreate a powerful heat ray used by them in the ancient war. While he's doing this, Thorne is fighting for his life against monsters, the Ma Gongi and the machinations of Sel Han. He meets not one--but two--beautiful and capable women; and he gets captured several times. On one occasion, he's sent to supposed certain death as a slave in the baridium mines. Finally, he and a small military force are trapped in a castle, surrounded by Sel Han's army and threatened with a quartet of large heat ray guns. There's also a traitor in their midst--but Thorne might actually be able to use the traitor to get the best of Sel Han. It's all good stuff, with exciting fight scenes and a few nice twists at the end. The climax involves a desperate raid against an large enemy force, a chase involving gawrs and a last-minute rescue followed by a last-minute rescue followed by a last-minute rescue. I especially like the way Kline manages to toy with our expectations involving the two female characters while all this is going on. It all seems to end happily ever after. 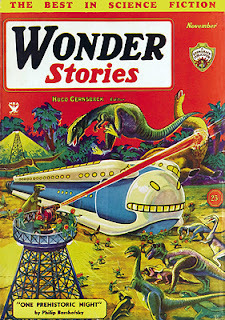 But life on a Planet of Adventure such as Mars never stays dull for long. 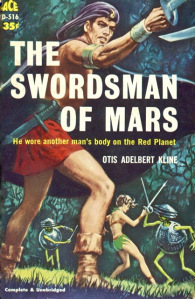 Kline would be returning to Mars in The Outlaws of Mars, also published in 1933. We'll take a look at that one soon. 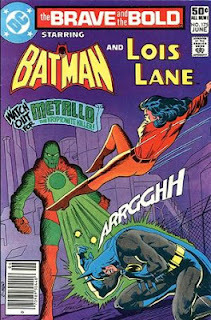 This week we will look at one of several post-apocalyptic futures set in the DC Comics universe. Next week, we'll visit the Marvel Universe to see what sort of horrors the future offers us there. Setting stories in a variety of possible futures is a common trope in both DC and Marvel. And, when you think about it, it's not surprising that so many possible futures within these universes are so horrific. If you don't have conflict, you don't have drama. Wrecking civilization is a great way to generate conflict. When Jack Kirby went to DC in the early 1970s, one of several characters he created was Kamandi, The Last Boy on Earth. Editor Carmen Infantino had tried to acquire the comic book rights for The Planet of the Apes. He failed (Marvel got the rights instead) and so he asked Kirby to create something similar. The result is my personal favorite of his DC characters. Kirby’s imaginative, kinetic artwork is always fun to look at, regardless of the subject matter, but he was at his best when he had room to get as science-fictiony as possible. 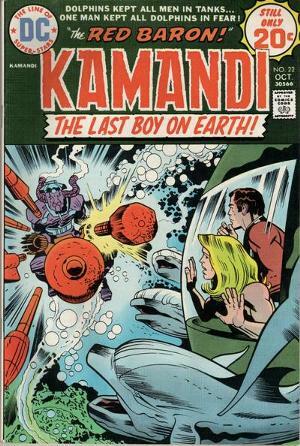 Kamandi was set in the future, after some never-explained catastrophe has destroyed civilization. Now intelligent animals ruled the Earth, while most humans had been reduced to sub-intelligence and dropped quite a few notches down the food chain. The series gave Kirby a chance to draw everything from bipedal wolves armed with machine guns to futuristic vehicles to flying sharks. It was, in other words, a near-perfect world for him to play in. The action picks up in the first panel, along the shore of a sea where most of the Midwestern USA used to be, with Kamandi getting involved in a fight to protect a dolphin named Inspector Zeel. 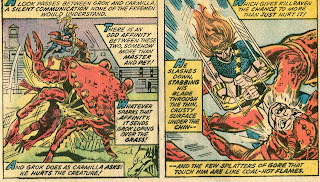 Menaced soon after that by a giant crab, Kamandi opts to join up with Zeel for mutual protection. Zeel is being carried in a water-filled container by his inarticulate human body guard. The companions must trek across a radioactive landscape, where they are attacked by Neanderthals and Zeel is almost killed. Finally, they reach “Seaway,” the underwater home of the dolphins. 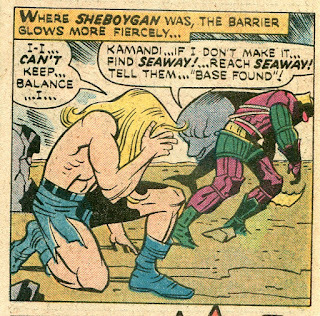 Here Kamandi is reunited with Ben Boxer, Steve and Renzi, three mutant humans with whom he had traveled for a time in earlier issues. These three have the ability to transform their bodies into steel. 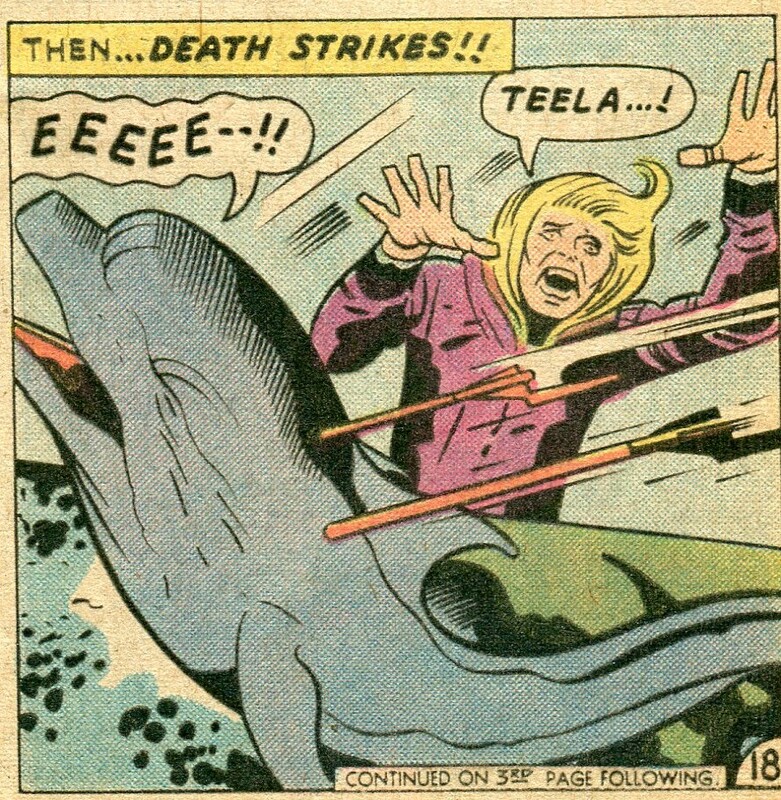 Kamandi learns that the dolphins are at war with the killer whales, with both sides using humans as soldiers. 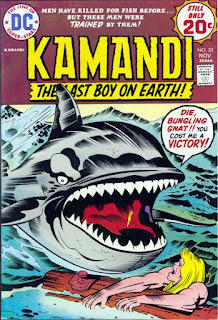 After a young dolphin who befriended Kamandi is killed, the Last Boy on Earth decides to himself join the fight. He soon finds himself trying to track down The Red Baron, an enemy human who uses his underwater craft to perform deadly hit-and-run raids. But the Red Baron continues to get the best of the dolphins and their human soldiers. Casualties are high--including Zeel's human guard. Finally, Ben Boxer and the other mutants come up with a plan to lure the Red Baron into a trap. 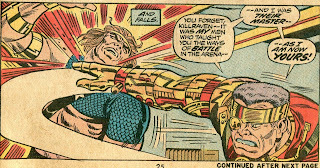 Kamandi volunteers to act as bait for the trap--which leads up to yet another brutal confrontation with the Red Baron. Gee whiz, this is cool stuff. I read these issues as a little tyke--having bought them at the local 7-11--so my opinion is arguably colored by nostalgia. But a dolphin vs. killer whale war using humans as cannon fodder? How is that NOT completely awesome? 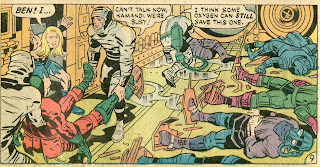 That being said, these issues do also hightlight Kirby's faults when he wrote his own scripts. Without someone like Stan Lee to flesh out his plot ideas, his characterizations were often one-dimensional and his dialogue was sometimes stilted. 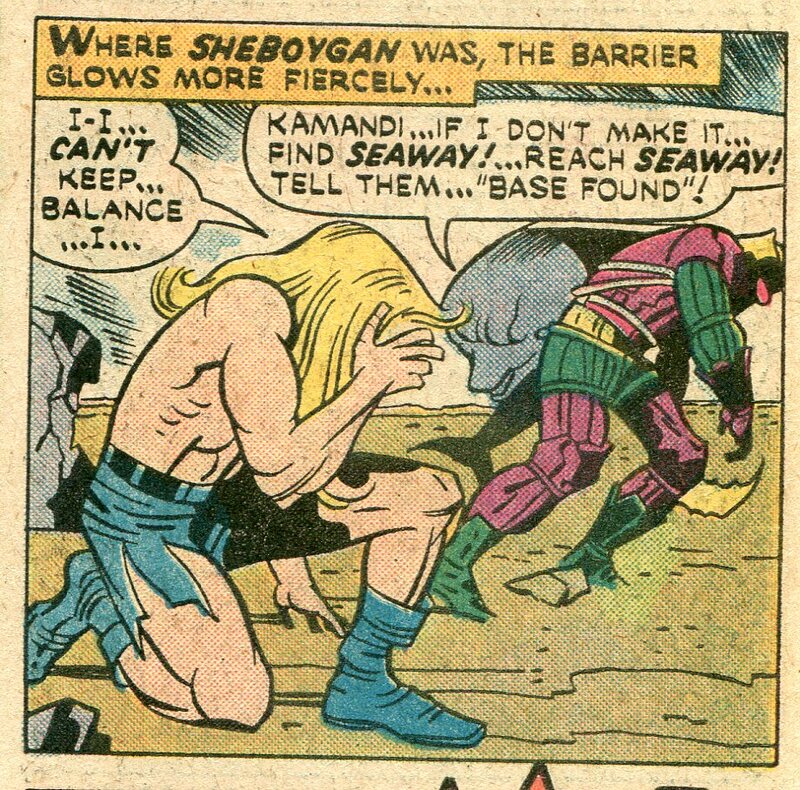 But the strength of his story ideas overcomes these faults and his wonderful art still make Kamandi a fun comic book. The world he created for this comic book had it's own internal logic, but it was a logic that allowed for endless variety in terms of plot ideas and fantastic imagery. The setting allowed Kirby to keep layering one amazing idea on top of another and still have it all make story-sense in the end. 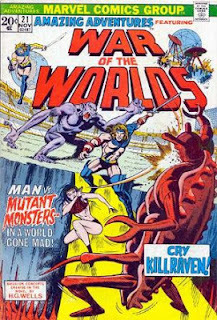 In the first issue of this three-part tale, for instance, he starts with a wild melee involving sword-wielding humans pouring out of a submersible craft to assassinate a dolphin, then tosses a giant mutant crab into the mix. 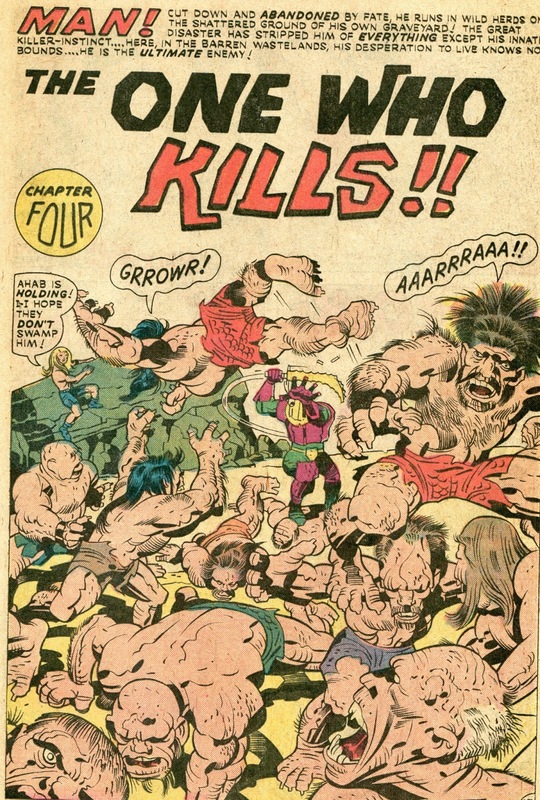 A few pages later, there's a stampede of giant frogs, followed by a tribe of nine-foot-tall Neanderthal men, followed in turn by a giant insect forcing its way through a radioactive barrier. 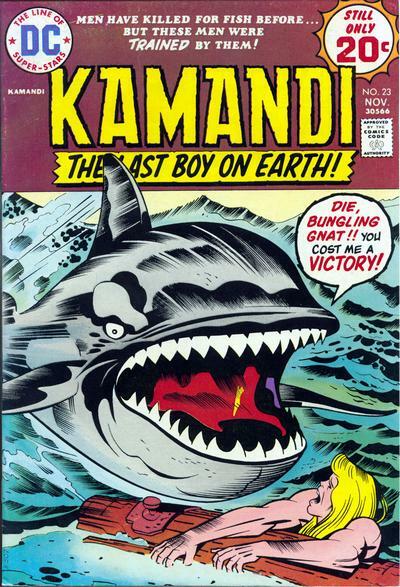 In the second issue, he moves the action to an undersea city built by talking dolphins and gets Kamandi involved in a bizarre war. The story moves at a furious pace and it all makes sense in the context of this particular future Earth. And, of course, the art is so good it makes you want to beat up anyone who doesn’t think so. 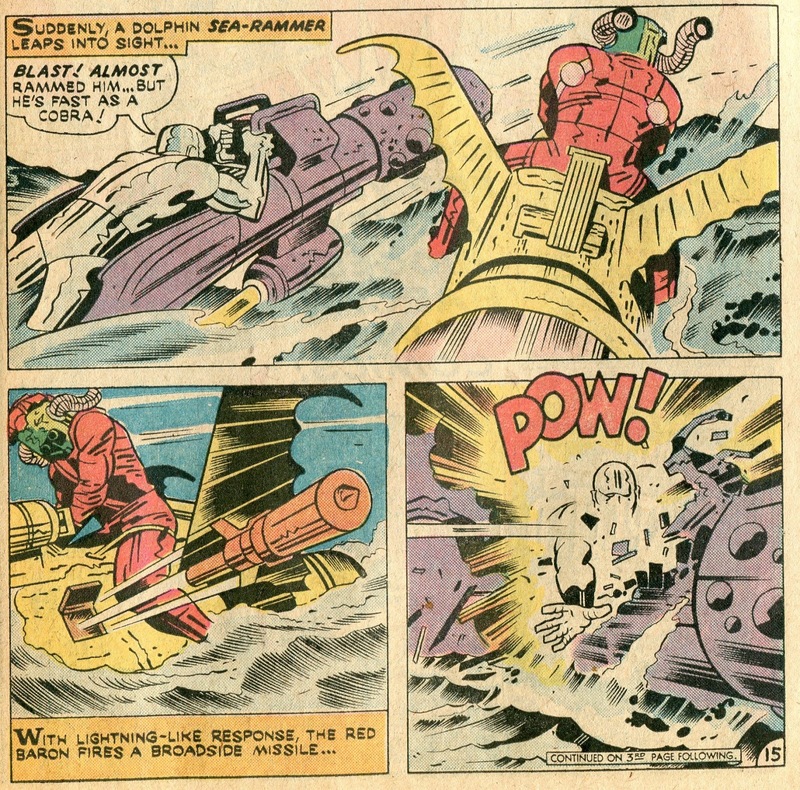 Everything from the design of the armor and weapons used by the human soldiers to the dolphins’ underwater civilization to the Red Baron’s attack vehicle just oozes with a sense of pure fun. 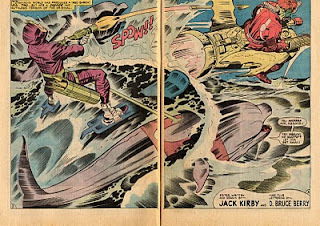 A two-page splash illustration of Kamandi, being pulled on water skis by a pair of dolphins, trying to nail the Red Baron with a spear gun, is alone enough to make the whole story worthwhile. 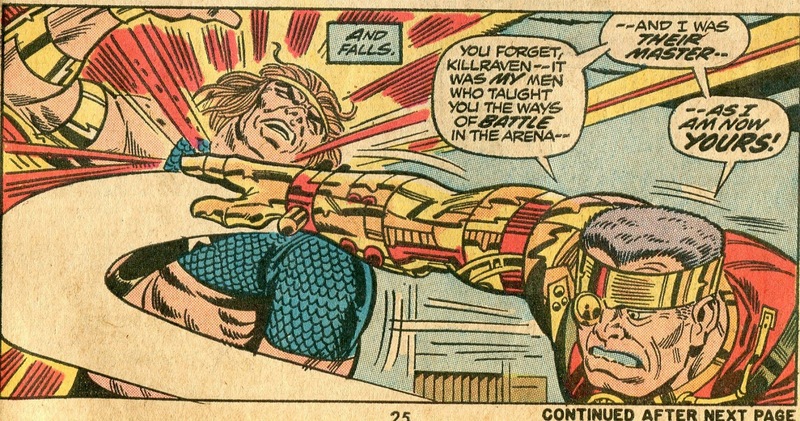 I suppose it can be argued that Kirby's art is so awesome that it causes the story to fail on one level. 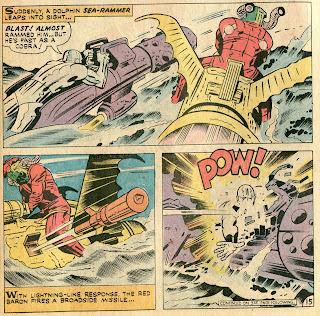 Kirby obviously wanted to use the dolphin-whale conflict to comment on the brutality and waste of war. To an extent, he succeeds. But the art is so gosh-darn FUN to look at, the point about war's brutality kind of gets lost in a sea of awesome imagery. Film director Francois Truffaut said that it's impossible to make an anti-war movie, because the movies will make inevitably make war look exciting. 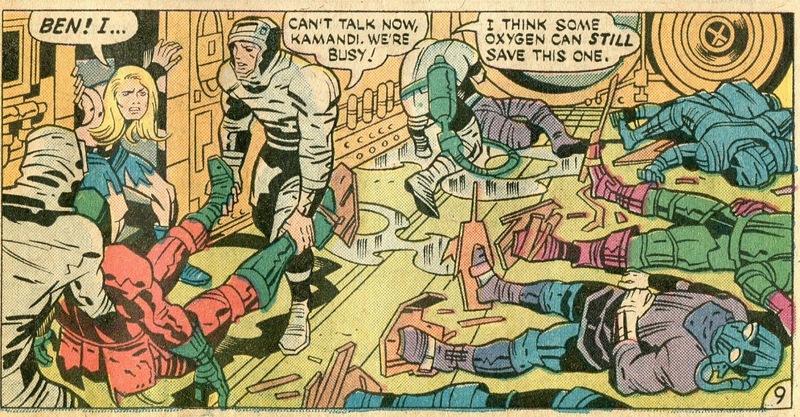 The same problem exists with this Kamandi story arc. 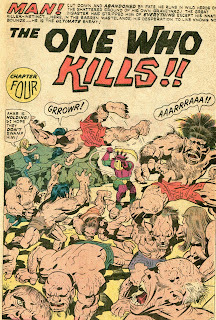 Kirby shows heavy casualties and several characters we like get killed. But in the end, we won't think about that. We'll instead imagine ourselves on a pair of water skis, drawing a bead on the Red Baron with a harpoon gun while a pair of dolphins tow us forward. Seriously, how is that NOT awesome? 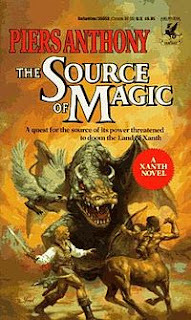 Piers Anthony's early Xanth novels were very good and this action-packed cover certainly does justice to the contents. A woman on a skiing trip asks the Saint to pretend to be her husband in order to protect her from her ex-husband. She also wants her ex-husband protected from his new wife so that alimony payments don’t stop. All this inevitably leads to a murder and a body being hidden in a unique spot—as well as Simon using snowballs to stave off an assassin. Just another day in the life of the Saint. A few weeks ago, I was having a conversation with a co-worker that somehow slanted towards children's literature and the Land of Oz. For the life of me, I cannot now remember how we got there, but there we were. I'm a purist in such matters, so whenever I think of Oz, it's the original Oz from L. Frank Baum's novels. (He wrote 14 all-together.) The 1939 movie is brilliant and deservedly considered a classic, but it's Baum's fairy-land that represents the real Oz in my mind. And whenever I think of Oz, I think of the 12th book in the series--1918's The Tin Woodsman of Oz. Because if you had a contest to identify the oddest plot in the history of children's literature, this book would definitely be in the running for first prize. To set all this up, a little background information is required. Also, I'm going to have to pretty much spoil the book's ending to discuss it properly. You can read the book HERE if it's new to you. Baum was a wonderful writer, with a straightforward prose style that just seemed to make the magical lands he wrote about all the more magical. 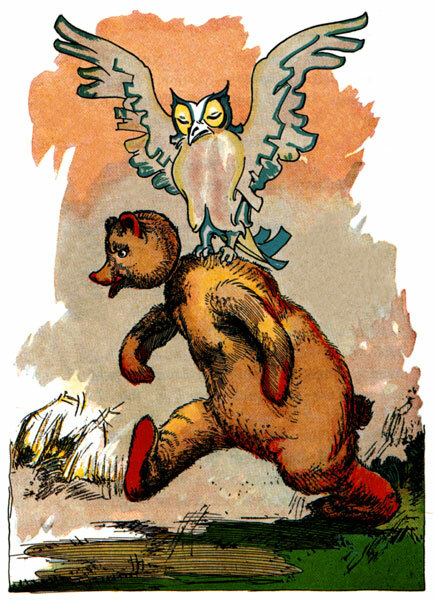 He wrote a number of non-Oz books (The Life and Adventures of Santa Claus from 1902 being one of my favorites), but these never sold as well as the Oz series. So, just as Arthur Conan Doyle was stuck with Sherlock Holmes, Baum was stuck with Oz. I don't think Baum was as annoyed by this situation as was Doyle. If he had an idea for a plot or a character that he had wanted to use in a non-Oz book, well, by golly, it wasn't that hard to make it fit into Oz itself instead. Michael O. Riley, in his book Oz and Beyond: The Fantasy World of L. Frank Baum, writes "...Baum now had no other outlet than the Oz series for his imaginative countries, and the fact that he funneled all his creative energies into Oz may be an indication that he had become reconciled to his readers' preferences for Oz stories above his other types of fantasies." The result of this was Oz becoming more inherently magical and more bizarre than it had been in the original 1900 novel The Wonderful Wizard of Oz. To quote Riley once more: "In the first six books, Glinda is the principal source of good magic in Oz, and her magic is limited. In the last eight books, magic workers, magic implements, and the use of magic increase enormously." 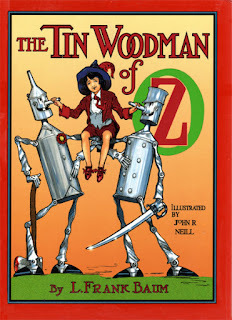 In the original novels, the Tin Woodsman was not originally built from tin. He was, in fact, a human, in love with a young lady who worked for the Wicked Witch of the East (the witch that was eventually pancaked under Dorothy's house). Not wanting to lose her servant, the Witch put a curse on the Woodsman's ax, making it cut off a part of his body ever time he used it. 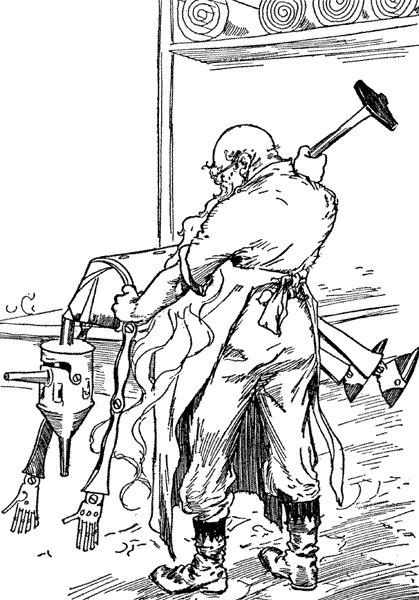 He went to a tinsmith each time this happened, gradually getting his entire body replaced with tin. Why he kept using the same ax is not discussed. Then he's caught in a rain storm and rusts up until found by Dorothy and the Scarecrow. And he didn't have a heart at that time anyways, so he didn't love the girl anymore. In Tin Woodsman, he's reminded that he never went to find his old girlfriend even after he got a heart. So, along with the Scarecrow and a kid named Woot the Wanderer, he sets off to find her and propose. The trio have a series of odd individual adventures, reflecting the episodic nature of the later Oz books. They get trapped in the castle of a lady giant and transformed into animals. Woot is threatened by hungry dragons and the Scarecrow by a strange creature that eats straw. There's several other mini-adventures as well. But this is okay, since each adventure is well-constructed, with the heroes coming up with clever solutions to extract themselves from trouble. Finally, they stumble across a Tin Soldier. And, yes, the Soldier had fallen in love with the same girl, had his sword hexed by the Witch and had his body gradually replaced by tin through exactly the same circumstances. That's bizarre enough, but things really get weird when they visit the tinsmith. He's still got some of their body parts stored away, including the Woodsman's original head. 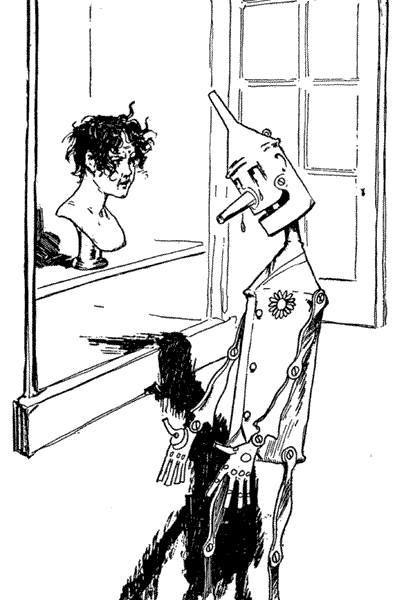 And nothing ever dies in Oz, so the Woodsman has an awkward conversation with his "meat" head. Then things get really, really weird. They eventually find the girl, but she's already married. 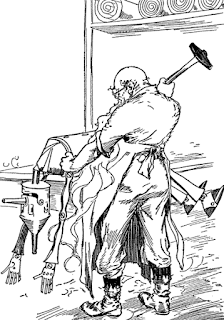 Because, you see, so the tinsmith was able to use magic "meat glue" to make a sort of Frankenstein being (named Chopfyt) out of body parts originally belonging to both the Woodsman and the Soldier. The girl: "...I married him because he resembled you both. I won't say he is a husband to be proud of, because he has a mixed nature and isn't always an agreeable companion. There are times when I have to chide him gently, both with my tongue and with my broomstick. But he is my husband, and I must make the best of him." 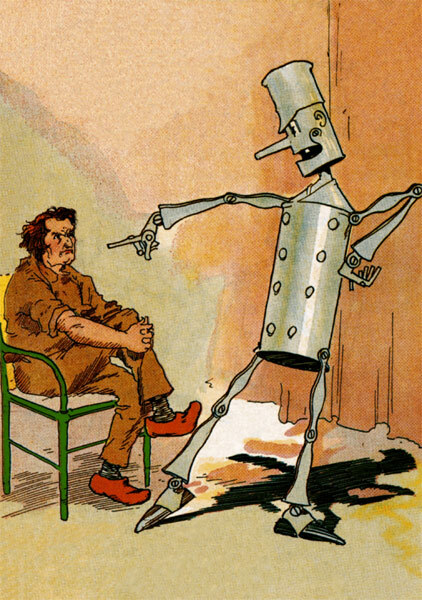 "If you don't like him," suggested the Tin Woodman, "Captain Fyter and I can chop him up with our axe and sword, and each take such parts of the fellow as belong to him. Then we are willing for you to select one of us as your husband." "That is a good idea," approved Captain Fyter, drawing his sword. "No," said Nimmie Amee; "I think I'll keep the husband I now have. He is now trained to draw the water and carry in the wood and hoe the cabbages and weed the flower-beds and dust the furniture and perform many tasks of a like character. A new husband would have to be scolded—and gently chided—until he learns my ways. So I think it will be better to keep my Chopfyt, and I see no reason why you should object to him. You two gentlemen threw him away when you became tin, because you had no further use for him, so you cannot justly claim him now. I advise you to go back to your own homes and forget me, as I have forgotten you." So that's that. 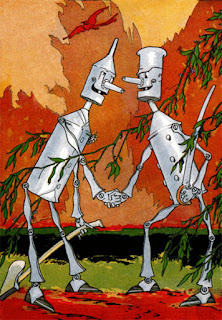 The girl lives happily ever after with Chopfyt and the Tin Woodsman returns home thinking that it all might have worked out for the best anyways. When I recounted this tale to my co-worker, she suggested that Baum had family issues reflected in this situation. I did a little research into Baum, though, and it seems that he was happily married. 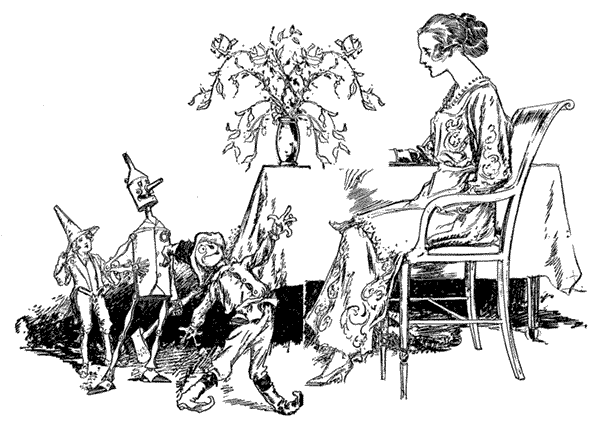 But there is one interesting incident recounted in L. Frank Baum: Creator of Oz, by Katharine M Rogers. Frank brought home a dozen jelly donuts one day. His wife Maud was chagrined, wondering if this was a criticism of the food she brought home. She then proceeded to serve him a donut each day--even after they had grown stale. Frank learned his lesson. Maud was the queen of the household and Frank wouldn't be bringing home any food unless she ordered it. So Frank was well-trained, just as Nimmie Amee trained Chopfyt. I have a feeling that Baum was getting in a loving "Take That" at his wife. Which, if true, doesn't make the plot or the resolution of The Tin Woodsman of Oz any less bizarre. Because Oz was indeed an odd place. When we think of the Phantom Zone criminals, we usually think of General Zod--largely because Terrance Stamp made him a such a classic villain in Superman II (1980). Zod was mentioned as a prisoner in the Zone in its first appearance (Adventure Comics #283--April 1961) and he was always recognizable in group shots of those exiled in the Zone because of the military hat he wore. But he was only one of many Kryptonian criminals. 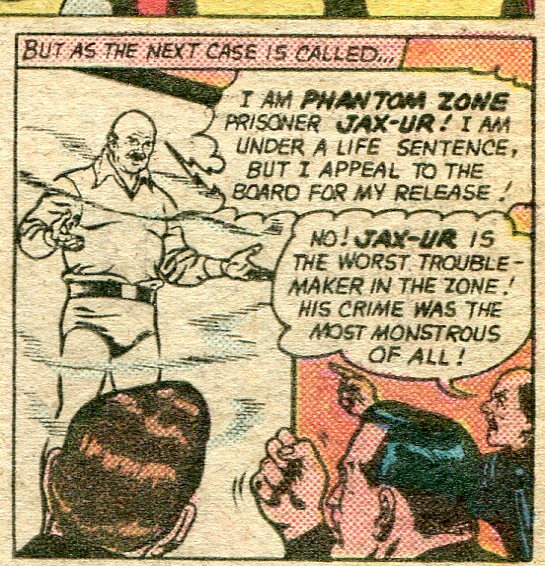 In fact, a mad scientist named Jax-Ur can arguably be said to be the most prominent Phantom Zone villain during the Weisinger years. What is the Phantom Zone? Well, I'm glad you asked. On Krypton, criminals were once placed in suspended animation. But then, Jor-El discovered the Phantom Zone--a "twilight dimension" that exists outside of normal space/time. Put someone in the Zone and they become effectively immortal, but are no longer able to interact with our dimension. They can, though, observe us. So keep in mind the next time you're taking a shower, somebody in the Phantom Zone might be watching. 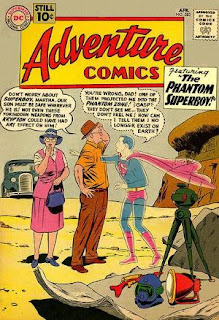 Superboy eventually found a Phantom Zone projector when he discovered a cache of Kryptonian weapons (shot to Earth by Jor-El years earlier). By the time he was an adult, he and a council of men from Kandor would form a Phantom Zone parole board to see which of the exiled criminals might have reformed. 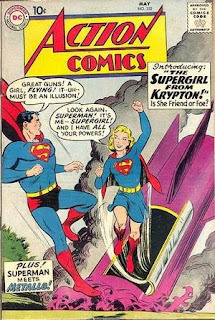 That brings us to Action Comics #310 (March 1964), whose cover story was written by Leo Dorfman and drawn by Curt Swan. 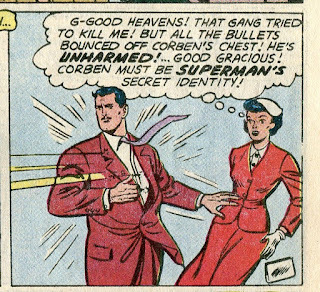 Like many Silver Age Superman stories, this one jumps exuberantly from plot point to plot point. Superman is on the way to his Fortress of Solitude. 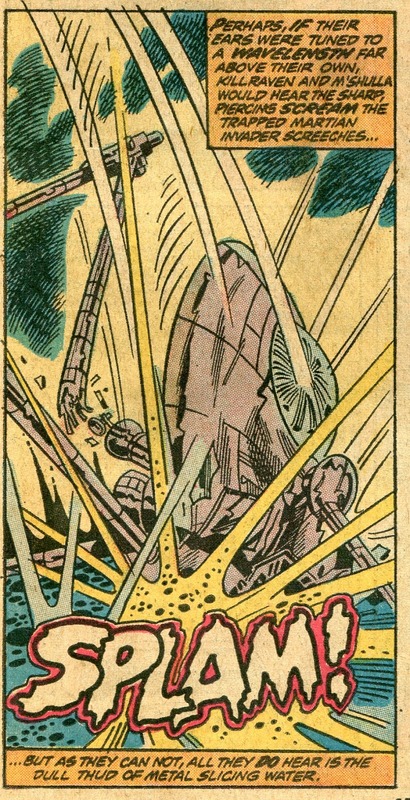 But on the way there, he learns that the denizens of Atlantis are suffering from a plague. This, by the way, isn't the Atlantis ruled by Aquaman. This Atlantis is inhabited by telepathic mer-people. Yes, the DC Universe has two separate and distinct undersea kingdoms. And why not? The bottoms of Earth's oceans take up an awful lot of square mileage, so there's plenty of room for two kingdoms. Though one of them really should have chosen another name. Apparently, undersea kingdom copyright laws are lax. Superman can't find a cure for the plague, but during a meeting of the Phantom Zone parole board, the exiled mad scientist Jax-Ur claims to have reformed and know how to cure the plague. He's provisionally released for one day. He and Superman then use a time capsule to travel back to pre-explosion Krypton, where Jax-Ur can find the element he needs to make the cure. 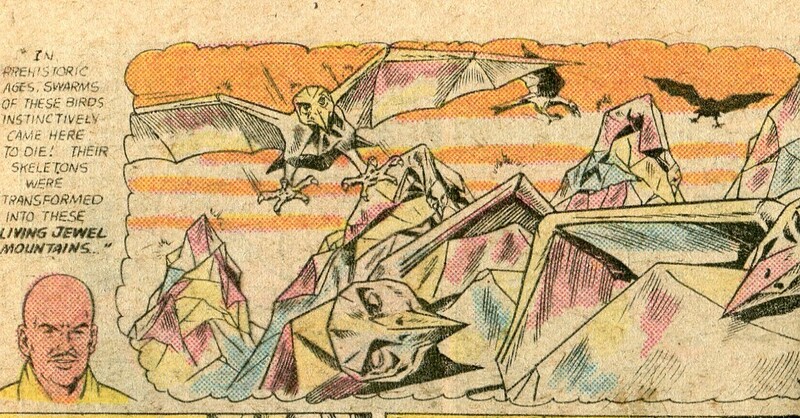 They stop at the Jewel Mountains--formed eons earlier when now-extinct giant crystal birds came there to die. The Mountains are the skeletons of the birds. The origin of the Jewel Mountains has absolutely nothing to do with the main plot. It's simply tossed in there because it's a cool idea. This is why I love the Silver Age. Jax-Ur gets what he needs and cures the plague after returning to present-day Earth. But that's not the only thing he did while in the past. He also fiddled with the atomic structure of a chunk of the Jewel Mountains, so that it would become "Jewel Kryptonite" when the planet exploded. He's also calculated that this particular chunk of the mountain will be blown towards Earth. Jax-Ur is sent back to the Phantom Zone until the next parole hearing, but that's just fine with him. Because jewel kryptonite allows him and the other Phantom Zone criminals are now able to focus their mental energies and cause explosions on Earth. 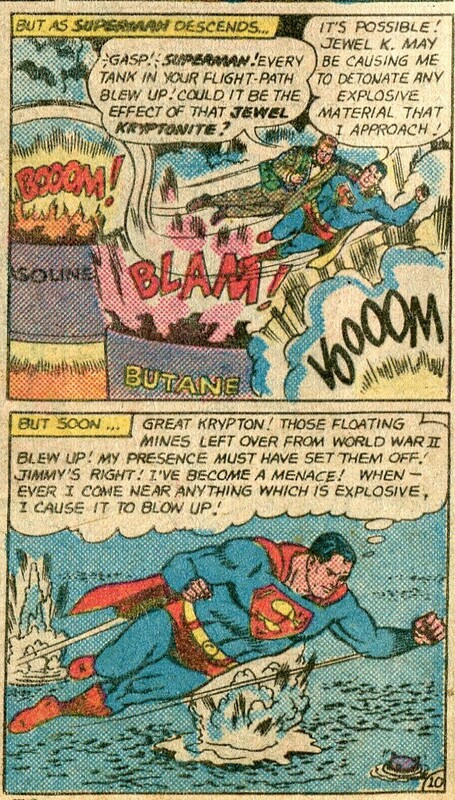 They start blowing up gas and oil storage tanks whenever Superman is nearby, causing him to think that jewel kryptonite has made him a danger to those around him. Did I say the story jumps from plot point to plot point with exuberance? It actually jumps with wild abandon. But it has fun while doing so and--like so many other Weisinger-era stories--it manages to follow its own internal logic. This is something I know I'm making ad nauseum when I talk about these stories, but it's important. It's what made the stories work as stories--they make sense in a way that we readers can understand. Despite the innate silliness of it all, Superman's universe and the stories being told about that universe had a definite structure. Superman manages to deduce what's really happening before leaving, though, and he gets rid of the Jewel K by tossing it into the sun. 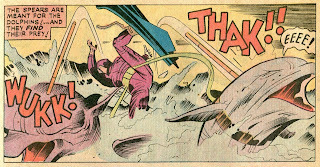 It's a good ending--allowing Superman to use his brains rather than his more overt powers to solve the problem. There is a glitch, though. In a detail that Dorfman and Weisinger overlooked (or chose to ignore to bring the story to an end at the proper page length), it's made to look as if Superman carelessly risks the life of a father and a young boy by casually flying close to them when they're near something combustable. Oh, well, it's still a good story. 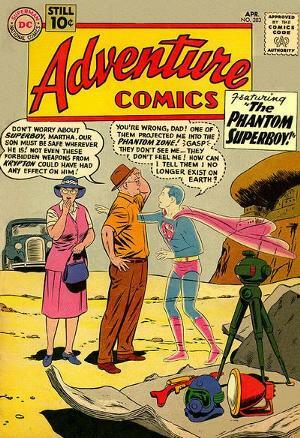 The Phantom Zone criminals were used on occasion throughout the Silver Age--often with quite clever plot devices being employed to get them into the story. According to the DC Wiki, Jax-Ur had 30 pre-Crisis appearances, while General Zod had 39. Eventually, Zod would grow more prominant and Jax-Ur would fade into comic book obscurity. But Jax-Ur managed to get in a fairly respectable career as a super-villain nonetheless.